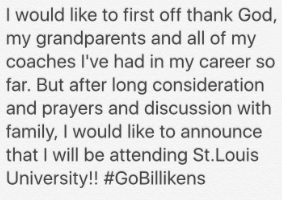 Five-star basketball stud Carte’Are Gordon, a forward from Webster Groves’ Class of 2018 will be staying home in St. Louis after he announced on Twitter that he has committed to Travis Ford and Saint Louis University, Wednesday morning. Gordon just released his top three schools Tuesday night, with Mizzou and KU on that short list with the Billikens. Less than 12 hours later, Gordon picked SLU. He tweeted his announcement after jotting these words down on his notepad off his phone. Gordon is considered a five-star recruit by ESPN and Rivals. He won a gold medal with USA Basketball at the FIBA U17 World Championship in June. You can follow Gordon on Twitter. Its not even worth writing up individual stories for Mizzou, Missouri State and Saint Louis. You’ve come here for one stop shopping for the sad state of Division I basketball in the state of Missouri. All three teams lost on Wednesday night and each one uglier as the night went on. For starters, the Bears were going for their fourth straight road win in Missouri Valley play, and let a 12-point lead slip away as they lost at Indiana State 68-59. MSU melted away in the final eight minutes of the game. The Bears play four freshman and at least with Paul Lusk’s team, they are showing some positive signs of improvement. Not to make an excuse, the Bears were also without their big inside presence with Camyn Boone who is nursing an ankle injury. Three Billikens posted career-scoring highs in a thrilling 96-87 Saint Louis win over Davidson Wednesday night in Atlantic 10 Conference men’s basketball action at Chaifetz Arena. Ash Yacoubou (27 points), Jermaine Bishop (23 points) and Aaron Hines (18 points) all recorded career scoring highs. The 96 points scored by the Billikens are a Chaifetz Arena record. In addition, it is the most points in a conference game since they scored 98 points against Loyola Chicago in 1990-91 as a member of the Midwest Collegiate Conference. With the win, SLU improves to 7-11 overall and 2-4 in the A-10. Davidson dips to 11-6 and 3-3 in the league. It almost seemed like a wasted trip to Athens, GA. for the Missouri Tigers who started SEC play by missing two shots, and turning the ball over twice in the openings two and a half minutes. Before fans could settle in, Georgia was up 10-0. Mizzou never recovered, suffereing their 19-straight SEC road loss, 77-59 to the Bulldogs. The closest Mizzou would get would be six, as the Tigers fall to 7-7, 0-1 in SEC play. 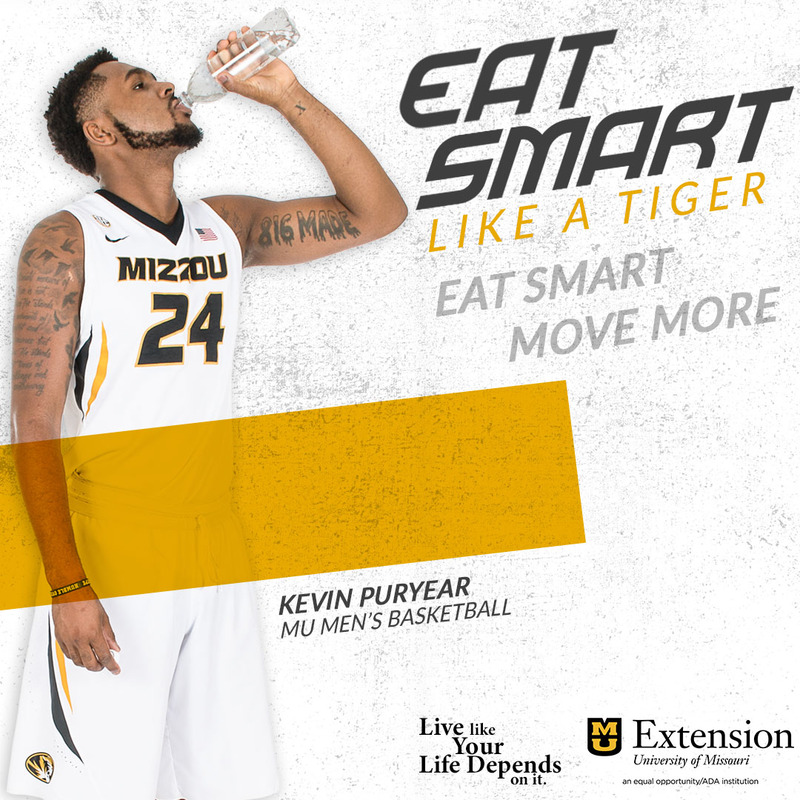 Kevin Puryear led Mizzou with 19 points, Wes Clark had 13. 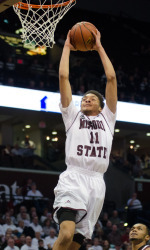 A driving layup by Dequon Miller with six seconds left gave Missouri State the win over visiting Northern Iowa, 59-58. The Bears snap a four-game losing streak to get to 5-10, and they also snap a four-year six-game losing streak to the Panthers. Saint Louis’ Mike Crawford hit a go-ahead 3-pointer with 24 seconds left and iced the game with a pair of free throws as the Billikens beat George Washington 65-62. GW was 12-2 coming into this game, so a nice win for the Billikens who were down by 12 in the second half. SLU is 6-8, 1-1 in A-10 play. The UMKC men open WAC play tonight at home against Seattle. A win by the Roos would make them 7-0 at home, tying a school record to start the season. –Mizzou Volleyball closed out its 2015 Tiger Invitational Saturday evening inside the Hearnes Center with a 3-0 (25-21, 25-15, 25-17) sweep of North Texas. Junior Carly Kan, redshirt sophomore Kira Larson, and freshman Alyssa Munlyn were each named to the All-Tournament Team for their standout weekends. 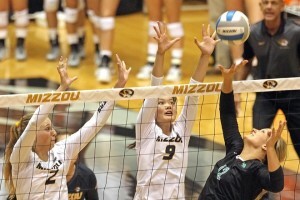 Kan was named MVP of this weekend’s tournament, as she earned 50 kills on .430 hitting with 31 digs in three matches. –The Missouri State volleyball team earned a 3-2 win over Western Michigan and a sweep of host Milwaukee Saturday to finish the Pepsi Panther Invitational with their first 3-0 start since the 2010 season. Senior Kinsey Batten was named tournament MVP, while sophomores Lily Johnson and Lynsey Wright joined her on the all-tournament team. Missouri State hosts the annual Dr. Mary Jo Wynn Invitational at Hammons Student Center Sept. 4-5. The Bears open with Miami (Fla.) on Friday, and play Oral Roberts and Marquette on Saturday. –The UMKC volleyball team (2-1) closed out its opening weekend of play at the Redhawks Invitational with a 3-0 win over host Southeast Missouri State (0-3). 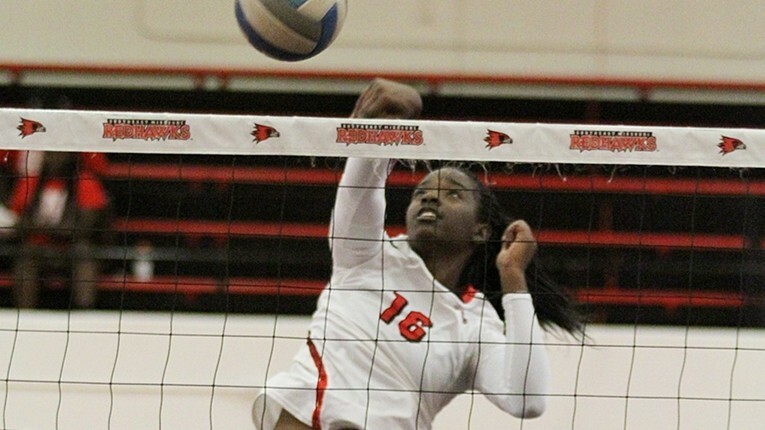 Missouri-Kansas City used a late first set rally to fuel a 3-0 (26-24, 25-15, 25-14) win over Southeast Missouri Saturday, the final day of the Drury Hotels Redhawks Invitational. Southeast had a 23-18 lead in the opening set, but couldn’t close it out. Missouri-Kansas City erased the deficit with an 8-1 run to edge the Redhawks, 26-24. That boost was all the Roos needed. Missouri-Kansas City took control with a 10-5 lead early in the second set and went on to win 25-15. The Roos, who were ahead by one (11-10) in the final set, mounted a six-point surge to polish off their sweep with a 25-14 victory. Clarke led Southeast with 12 kills and a .632 attack percentage. 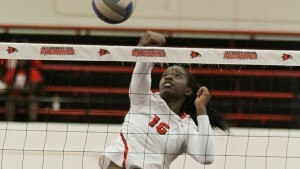 She played strong from the get-go, recording five kills and a .714 hitting percentage in the first set alone. Clarke finished the tournament, hitting .267 with an average of 1.10 blocks per set. She was named to the All-Tournament Team for her efforts. Southeast heads to the Gardner-Webb Tournament on Sept. 4-5. The Atlantic 10 Conference announced Saint Louis’ home and away matchups for the 2013-14 A-10 men’s basketball season. The Billikens, coming off the A-10 regular-season and tournament championships, will play home-and-home series with Dayton, Duquesne, A-10 newcomer George Mason and VCU. A-10 squads will play a 16-game schedule this season. The final schedule, with dates, will be released later this summer. Travis Taylor had 19 points and a career-high 19 rebounds and Xavier never trailed in the overtime, beating No. 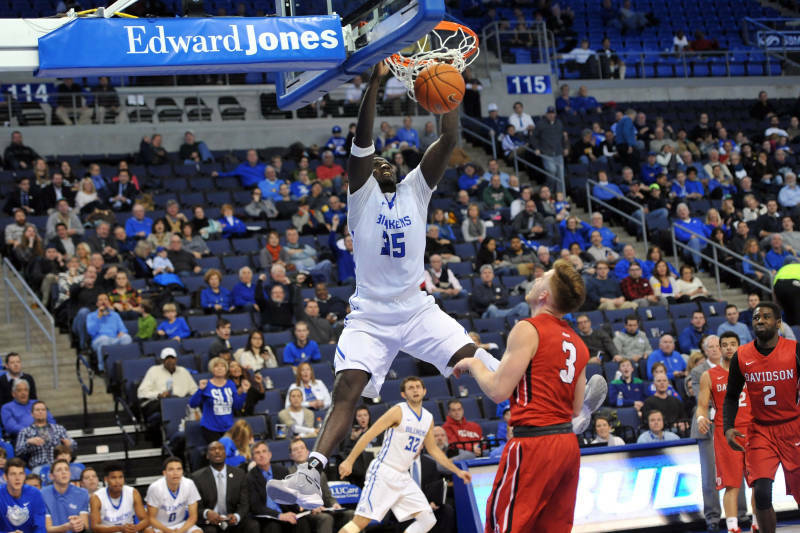 16 Saint Louis 77-66, ending the Billikens’ 11-game winning streak and leaving the Atlantic 10 title up for grabs. The Billikens (23-6, 12-3) had a chance to win a share of a conference title for the first time since 1970-71 in the Missouri Valley. Their last outright title came in 1956-57. They could have clinched the No. 1 seed in the conference tournament with a win on Wednesday. Instead, they fell into a first-place tie with No. 21 VCU, which beat Richmond on Wednesday. Saint Louis beat VCU during its 11-game winning streak for the head-to-head advantage. Saint Louis finishes the season at home against third-place La Salle on Saturday. VCU is at Temple on Sunday. The Billikens tied it on Jordair Jett’s tip-in with 11 seconds left in regulation, but they managed only one field goal in overtime. Taylor had a dunk and four free throws as the Musketeers pulled ahead 74-62. Kwamain Mitchell led Saint Louis with 17 points. Cody Ellis, the Billikens’ top 3-point shooter, missed all of his 15 shots — 11 behind the arc — and finished with four free throws. Saint Louis leads the league and is ranked 19th nationally, allowing only 57.9 points per game. Xavier is second in the A-10, allowing 62.3 points. Those stingy defenses were locked in during the first half, which ended with the Billikens leading 24-20 — the seventh time that Saint Louis has held an opponent to 20 or fewer in the opening half. College basketball opens tonight for Division I schools across the state, starting with the Missouri State Bears who will play at Nevada. It’s the regular season debut for head coach Paul Lusk. 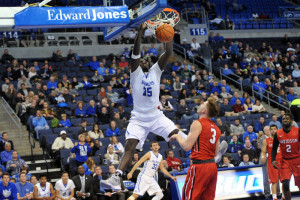 The St. Louis Billikens begin their season at home hosting Tennesee State. Another head coaching debut, of course, Frank Haith will lead the Missouri Tigers against Southeast Missouri State in a 7pm tip at Mizzou Arena. Here’s what the teams are saying about their programs and season openers. The top-ranked Duke Blue Devils posted an 84-47 victory against Saint Louis Saturday at Cameron Indoor Arena. SLU drops to 3-4 with the loss. Freshman guard Mike McCall led the Billikens with 15 points. Freshmen Dwayne Evans and Rob Loe led the team with six rebounds apiece. Smith scored 15 of his 22 points in the first half for Duke who won their 20th straight win. Kyle Singler added 21 points. Mike Krzyzewski moved within one victory of North Carolina’s Dean Smith for second place on the men’s all-time wins list. Coach K has 878 career victories, and can tie his former longtime rival on Dec. 20 against Elon trails Bob Knight, who has 902 wins. Saint Louis suffered an 11-2 setback against Louisville Friday night on the first day of the NCAA Baseball Championship’s Louisville Regional. The Billikens now face Illinois State today in an elimination game at 11 a.m. (CT). J.D. Dunn led the Billiken offense with a 3-for-4 performance at the plate. SLU’s two runs came via back-to-back home runs by Danny Brock and Jon Myers, which gave SLU a 2-1 lead in the fourth inning. Bryant Cotton was charged with the loss after six innings of work in which he allowed eight runs on 12 hits. SLU dips to 33-28 with the loss.